Bee Helpful to Your Insect Friends | Idealist Girl! Researchers estimate that one in three bites of food comes from a plant that was pollinated by a bee or other insect. When you consider how much bees have been in the news lately – and not in good ways – it is pretty frightening to think that we might be endangering our food security because we are not playing nicely with other species. So, what’s going on with the bees? Last year I blogged about colony collapse disorder, which scientists have good reason to think is caused by the class of pesticides know as neonicotinoids. While these pesticides are used by farmers and commercial growers, they are also available for your home use. Don’t buy anything that looks like this: Bayer 2-1 Systemic Rose and Flower Care, Bayer 3-in-1 Shrub Plant Starter, Bayer Complete Insect Killer for Soil and Turf, and Bayer Control. There’s even potting soil pre-treated with imidacloprid! Stay away from it! 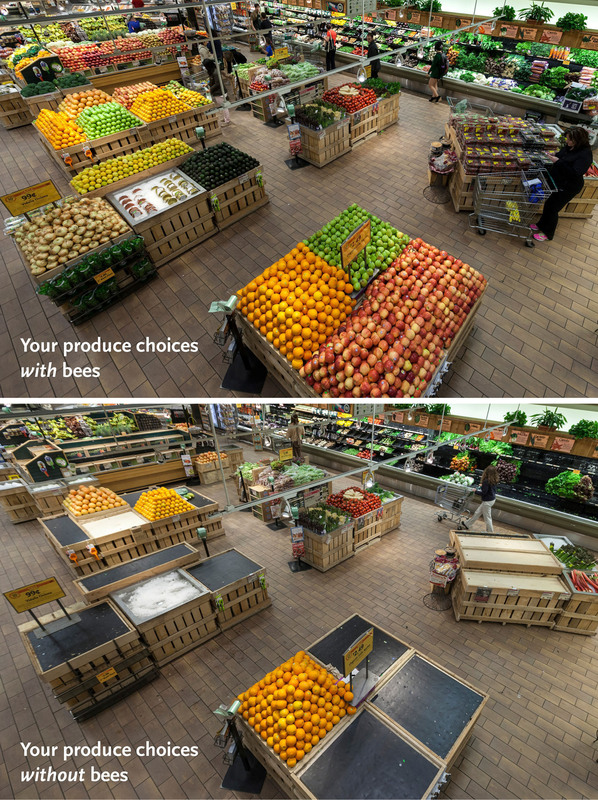 But what if you want to do something to help the bees, beyond avoiding pesticide use? I suggest using whatever growing space you have to plant pollinator-friendly plants. There are lists aplenty for you to peruse. This one lists Northwest native plants. [Wherever you live, throw in a healthy mix of natives so that your local solitary bees (like orchard mason bees) and butterflies have something to munch on as well]. Pollinators like clusters of flowering plants so that they can fly to one location and reap a good harvest. They also appreciate having plants that bloom for an extended period of time, or a succession of flowering plants that will last through many seasons. Late summer and early fall are perfect times to add flowering plants to your garden. Pollinators are foraging fast and furiously as they stock up for winter. You can scatter seed now that won’t come up until spring. If you want to plant perennials, wait until the weather cools and then plant them. They will start building up roots all winter long and be ready to burst into bloom in the spring. If you don’t own your property, you can still help. Talk with your landlord about avoiding pesticides. Plant flowering plants in pots on your deck or in common spaces. Build a mason bee house. Dream big! Approach your landlord or homeowners’ association about landscaping with pollinator-friendly plants. My dear mother did this, and now her town home community is a haven for bees. It is truly amazing how the landscape has transformed and is sustaining a healthy population of pollinators. Here are some common flowering plants that bees love. Please bee careful of your plant source. Home Depot and other suppliers use pesticides to treat their nursery plants.